Now I like the new one. I take it the agogo bells and increased syncopation of the "B" section is good? Yes. There is very little that I find sexier in music than syncopation. I think it's wonderfully evocative, one of your most so since Sunken Ship (which is one of my favourites). It's really, really good, Irot! Expect the second flashback theme soon. It's definitely making progress. You will notice that I used three different songs to create this one: An expanded version of "Flashback I" (Which is Neo Bay, as you may recall), the first few notes of "Team Rocket Theme", and the bass ostinato of "Rocket Base - Relaxed". See if you can spot- er... hear them as you give this a play through! EDIT: I swear I'm not tone-deaf! The "out of tune" bells that float over the piece are deliberately placed a tritone from tonic as to create an eerie atmosphere. They are also placed canonically one measure later than everything else, which gives the feeling of a "ghost from the past", or at least that was my intention. Hopefully the bitonality doesn't turn you all off! Last edited by Irot_Rebod; 11-18-10 at 06:35 AM. I like it. It's an really good dark twist on the original flashback theme, and the bitonality just adds to that. I showed some of my friends the Topaz music not too long ago, and I started with Sunken Ship since I like it so much. One of my friends liked it so much that when I moved on to the epic Gym Leader Battle theme she said "Stop! I really want to finish listening to that last one! This one's great and all, but that one's just awesome." So I know I'm not the only one! Be proud of it! Glad you like the new take on the Neo Bay theme... I was surprised how well the A and B sections sounded when converted to minor. Now, I find that absolutely interesting. I love composing music, but I find the most intriguing aspect of it to be how listener's respond to my very different styles of composition. I'm glad that some of my "simpler" music is appreciated. I think my music friends sometimes write "simple" music off as "boring" or "poorly written" music. In all actuality, "simple" will usually leave a more memorable experience on a listener than "complex." On a side note... Orion Theme is in the rafters just waiting for the time to strike. Expect it soon. Do you have anything against me using a few of these for my Pokemon RPG? I could give you credit for them, but the main one I want to use is the Legendary Battle one. It's epic. Is okay for me to use a few of these songs? As the composer (/arranger of that piece, in particular), I give you my permission. But, being that it was created for Topaz, you'll also need the project's permission as a whole, I would think. Since you have Irot's permission, it's now up to ImmunityBow since he is the project leader. I'd appreciate if you could take up the matter with him via private message as not to get off-topic here. I can't seem to download these.....it wants me to upgrade and pay money. What am I doing wrong? You shouldn't have to upgrade. Clicking the download link (in blue, I believe) should work. Let me know if problems continue to persist. I also have some new music ready. I'm expecting a bit of apprehension on this one... it's definitely... bipolar? But I think that despite the bipolarity, the two sections compliment each other quite well. I'm also uncertain as to whether this should be the theme for Victory Road or be used for the Surfing track. Let me know what you all think! Well, I could dl every single one....one at a time. Which would take forever, and be a bit tedious. To dl more than one at a time I must upgrade. As far as your most recent one goes, I started to think it would be good for victory road, but then it became surfing for the remainder (quite suddenly). I don't think that, overall, it fits the character of one or the other. But maybe if you made two separate songs out of it you could get both. Oh, I'm not saying they don't go well together. But as a complete song, they don't really embody either places. That's all I meant. Hummm... I dunno, I don't want to dissect something I feel is a complete song and make two songs out of it. I will probably just write two new pieces and leave this floating around. It wouldn't fit for Victory Road, I don't think. Just cut off everything before about 0:28 and use it for surfing, I'd suggest. Also, what program do you use to make these songs? That's exactly what he doesn't want to do!! I don't see why having the same motive should be an inhibition towards cutting the piece into two separate pieces. A few of your other pieces have similar motives if I'm not mistaken (Colossus City and Triple Triad, if I remember correctly, and I think there are others too) and it could be related to a movie soundtrack, where themes and variations on them appear throughout the soundtrack. I like the theme a lot, A, B, A and B or otherwise. Together, I see it more as a Surfing theme than a Victory Road theme, and I can imagine Surfing to the A section. I use Sibelius to do my primary compositions, but I'd be a fool to simply compose using only that - I also make sure to have my piano and manuscript paper at the ready. I could use the themes, that's fine. But for this iteration of the theme morphing into the other variation... I'd rather keep that as its own entity. Actually, I'd love to use a few of the motives here throughout the rest of the soundtrack - I do still have a lot of music to compose (50+ tracks, I think. @_@). P.S. - the Orion's Theme is becoming my worst nemesis. I've gone back and forth from fanfare style, to "pop" style, not being able to determine minor or major... I think I've done about 50 circles now. XD Team Rocket has that mischievous, in-your-face theme, and it makes sense since they are the antagonists when you help the Defenders... but the other way around, wouldn't it seem strange if the Defender's theme was light-hearted? I agree, Orion can't be overly light-hearted. It should be intense...but more majestic and less sinister that Rocket, if that makes any sense. I feel that the way to approach Orion Defenders is to have a rather pompous theme that sounds very self-righteous rather than something lighthearted. Easier said than done, I know. Something like the FF7 Fanfare which was also for an antagonist (Shinra) yet was both memorable and reasonably happy. The A section doesn't seem to fit for a Pokemon surfing theme to me. I wouldn't mind breaking the (as you call it) "POGEYMANZ SURFING MUSIC MUST BE MAJOR AND WALTZY!" trend, but this doesn't seem to be right for surfing. If this were to be used for Victory Road (or anything else, really), I think the A section would be too short, and the B section too long. Don't get me wrong, it sounds awesome. If you're having trouble seeing is as a surfing theme, imagine surfing to it in the route outside Fortree City with it (the raining one where you get Feebas). It would make total sense. If I didn't get it, then chances are, other people who download Topaz won't get it. Also, I don't remember the route outside Fortree, so maybe later I'll go there in my Ruby version sometime. The counter to your argument is that IB got it. Music is hard judge unless you have more than 3 or 4 people critiquing. Maybe some more people should post their opinions... ? Enechestra City, maybe? I got *cough* inspiration *cough* from a song that I thought would fit a city/town theme. I'm leaning towards Enechestra, but maybe Laysan? Tell me what you all think! ... and a cookie to the person who recognizes the song (I arranged it, but sadly don't know the composer D: ). Definitely doesn't sound like Laysan. Some of the progressions remind me of a couple of the less anxious Phoenix Wright melodies, but I can't identify the inspiration. I like the theme, though it makes me think of other games. Harvest Moon, Animal Crossing, something more like that. EDIT: Listening to it loop it's growing on me even more, though my concerns still apply. Last edited by ImmunityBow; 04-25-11 at 03:03 AM. I see where you're coming from in your thinking that this is one of your more Pokemon-esque works, but there's just something about this one that's more... laid back than any Pokemon theme. Hmm... yeah, it's pretty laid back. I think the songs I'm remembering are (in reference to atmosphere) the HG/SS versions of Goldenrod and Cherrygrove/Mahogany, and (in reference to instrumentation) DPPt's Veilstone. 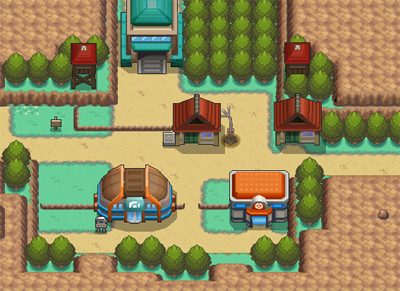 On a side note, is Laysan Town going to be a busier town? I've always imagined it quite small and humble based off the site text. Yes. If you want a canon reference, likely about Mahogany town sized. Secluded, but bright and happy. I think it sounds like Colossus City or a game corner, but that's just me. It's awesome, and has to be used somewhere. In interest of getting the surfing theme figured out, I have an idea. What if the surfing theme was instead a minor waltz? It would certainly continue a trend that Topaz has going for it, where we take something traditional and riff off in some other direction.